More than 9,000 empty seats at Sunday's loss against the Rams spoke louder than any boos could have. And there were a lot of boos. The temperatures may have been frigid, but it was nothing in comparison to the cold shoulder that more than 9,000 Broncos' fans gave the team. Sunday's game saw 9,131 empty seats. And sure, the cold weather may have played a factor in fans staying home, but many claim it's due to the leadership (or lack thereof) inside the locker room and the performance on the field. The last time the Broncos' stadium had this many empty seats was in 2010, when Josh McDaniels was the head coach, and he didn't make it through the season. And now, coach Vance Joseph is in the hot seat. Many fans feel that Joseph isn't going to make it through the season. In fact, some may argue that he should have been fired by the end of last season. And honestly, what better time to do a coach-swap than when you have a 10-day gap between games? Should we lose on Thursday night against Arizona, Friday morning could be the reckoning and give the Broncos 10 days to get things in order. 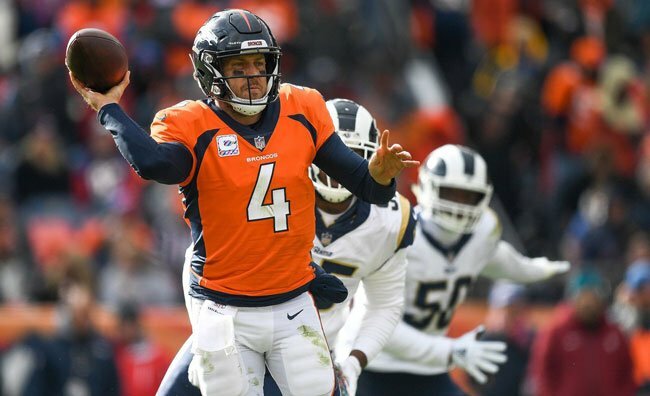 Others are claiming that quarterback Case Keenum is partially to blame for the lackluster season. In Sunday's game, he threw eight interceptions and had a 14-yard sack. And during the end of the first half, Keenum was replaced by backup Chad Kelly, much to the crowd's excitement, as he made his NFL debut. Keenum, once cleared, returned to play the second half, much to the crowd's chagrin. "Yeah, I've heard it, It's not the first time that the crowd's been unhappy with what's going on on the field," Keenum said. "They should be pissed. I'm pissed. We have to do better." And some fans are saying the Broncos' losses are due to the management style of John Elway, claiming that he got lucky with Peyton Manning and has been grasping at straws ever since in an attempt to fill the position he played so well. In all honesty, it could be a number of factors, some of which we didn't even discuss above. But at the end of the day, the Broncos need to make some changes -- and fast, if they're going to salvage this disappointing start to the season. We sat down with Dave Marvin, the director of the Broncos Stampede. Click here to read the full interview.